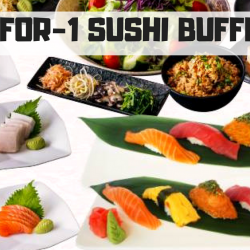 Till 31 May 2018 Shabuya and Shochu Bar: Enjoy 1-for-1 Sushi Buffet (UP $18.90++)! Did you hear? Shabuya is offering 1-for-1 Sushi Buffet this long weekend (U.P. $18.90++)! Enjoy free flow sushi, maki, handroll and more. Come on down to VivoCity to shop after a filling and satisfying meal at Shabuya!